When the survivors of Titanic ​reach New York, the city they see isn't the one you and I know. Here are some books, sites, and videos that helped me get there. Mary White Ovington, Half a Man, first published 1911. What it was like to be African-American in New York. A classic. ​New York Landmarks Conservancy, Andrew S. Dolkart and Gretchen S. Sorin, Touring Historic Harlem. A Renaissance in Harlem, ed, Lionel C. Bascom. Ralph Ellison's essay "Colonial Park" gave me the original information about the whiteness of Titanic. Jervis Anderson, This Was Harlem: 1900-1950. Strong on pre-Harlem Renaissance history. Michael Henry Adams, photographs by Paul Rocheleau. Harlem Lost and Found. Excellent book on 19C and early 20C Harlem architecture, with delicious photographs. Willard B. Gatewood, Aristocrats of Color: The Black Elite, 1880-1920. University of Arkansas Press, 1990. The Library of Congress, with David Levering Lewis and Deborah Willis. A Small Nation of People: W.E.B. Du Bois and African American Portraits of Progress. Amistad (HarperCollins),. 2003. A'Lelia Bundles. On Her Own Ground: The Life and Times of Madam C.J. Walker. Scribner, 2001. Martha A, Sandweiss, Passing Strange: A Gilded Age Tale of Love and Deception Across the Color Line. Penguin, 2009. My favorite story ever of passing in New York. Clarence King, a prominent (blue-eyed, white, Newport, Yale) man, fell in love with Ada Copeland, who was black. So, without telling her his racial background, he married her and, without making any change in his appearance, he passed as a black porter. Read the whole story. (Interesting side note: when Ada Copeland King died in 1964, she was one of the last Americans who had been born into slavery.) A fine book about "the possibilities and limitations of self-fashioning, the simultaneous rigidity and porousness of racial definitions, the fluidity of urban life." W.E.B. Du Bois, The Souls of Black Folk. https://www.pinterest.com/swrs/new-york-titanic-era/ A Pinterest board I run with views of New York City, mostly from postcards. Updated whenever I find something good. New York City Titanic Era My YouTube playlist of films of early New York. One of the films, The Year Was 1912, isn't particularly about New York--looks like London and Paris to me--but shows fashion models of the time and film of "Titanic" (Olympic masquerading as Titanic, as it often did). More videos come up on this playlist as I come across them. Nathan Silver, Lost New York. Classic. King's Views of New York 1896-1915 and Brooklyn 1905. Compiled by Moses King; new introduction by A.E. Santaniello. Arno Press, 1977. An early edition of Moses King is at https://archive.org/details/kingsphotographi00king but you can get this fairly easily used from Amazon (it's not in print). If you're writing about New York in this period, Moses King is your new best friend. Eric Homberger; Alice Hudson, cartographic consultant. The Historical Atlas of New York City. Henry Holt, 1994. Francis Morrone, with paintings by Childe Hassam, William Louis Sonntag Jr., Wiliam Merritt Chase, and Colin Campbell Cooper. New York: Memories of Times Past. Thunder Bay Press, 2008. New York through the eyes of the New York Impressionist school of painters. Soft-edged but evocative. Joseph Byron, text by Albert K. Baragwanath. 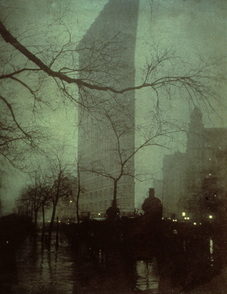 New York Life at the Turn of the Century in Photographs. Dover, 1985. Joseph Byron, text by Clay Lancaster. Photographs of New York Interiors at the Turn of the Century. Dover, 1976. Clay Lancaster, Old Brooklyn Heights: New York's First Suburb. Dover, 1979. Robert A.M. Stern, Gregory Gilmartin and John Massengale. New York 1900. Rizzoli, 1983. Many fab photographs; text concentrates largely on the architectural movements. William C. Shopsin et al., The Villard Houses: Life Story of a Landmark. Viking, 1980. William Hayes, original photography by Gilbert King. City in Time: New York. Sterling, 2007. New York City in 3D: A Look Back in Time. Voyageur Press, n.d. An indulgence, but if you like 3D, totally find it. New York Transit Museum with Vivian Heller. The City Beneath Us: Building the New York Subways. W.W. Norton, 2004. Lorraine B. Diehl, Subways: The Tracks that Built New York City. Clarkson Potter, 2004. "Down in the Subway, oh what a place! Under the isle of Manhattan, speeding through space/ Just the place for spooning, all the season 'round, Way down, way down in the Subway, Under the ground." Delicious compendium of New York subway lore. New York: Not Only Buildings. TeNeues, 2000. Vintage postcards. New York, the World's Metropolis. 1924, but much of the information is earlier. Excruciatingly boring text but some good photos, especially of commercial buildings. Henry Collins Brown, ed. Valentine's Manual of Old New York. Valentine's Manual, 1926, but deals mostly with the 1880s. Luc Sante, Low Life. FSG, 1991. Edward K. Spann, Gotham at War: New York City, 1860-1865. Scholarly Resources, 2002. M.H. Dunlop, Gilded City: Scandal and Sensation in Turn-of-the-Century New York. HarperCollins, 2000. Peter Salwyn, Upper West Side Story: A History and Guide. Abbeville Press, 1989. 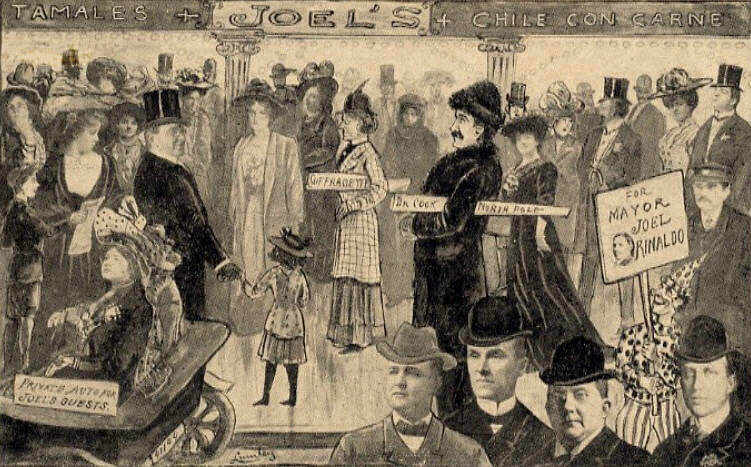 Justin Kaplan, When the Astors Owned New York: Blue Bloods and Grand Hotels in a Gilded Age. Viking, 2006. Kate Simon, Fifth Avenue: A Very Social History. Harcourt Brace Jovanovich, 1978. Julian Street, Welcome to Our City. Collier, 1912. Pete Hamill, Downtown. Little, Brown, 2004. A very personal history. Harpo Marx, Harpo Speaks...About New York. The Little Bookroom, 1961. Kathy Peiss, Cheap Amusements: Working Women and Leisure in Turn-of-the-Century New York. Temple University Press, 1986. William Grimes, Appetite City: A Culinary History of New York. North Point Press, 2009. Such a good book. The culinary horror of lobster with chili sauce, supposedly served at the Ritz on Titanic's first night at sea, comes from Alessandro Filippini's The International Cook Book, Doubleday, 1911, Joel Rinaldo's tamales and Blue Moon cocktails come from the lovely site Restaurant-ing through History: http://restaurant-ingthroughhistory.com/2008/07/17/joels-bohemian-restaurant/. Ellen Williams and Steve Radlauer, The Historic Shops and Restaurants of New York. The Little Bookroom, 2002. Joel Rinaldo's restaurant, New York City, showing New York figures of the time. This postcard was sent in 1912, on the very day when Perdita takes Bucky Pelham and Harry to dinner there.